Kingwood Outdoor Fireplaces – Warm Up Your Backyard! Kingwood Outdoor fireplaces are famous for adding style and ambiance to your outdoor space! When you choose Houston Outdoor Kitchen Pros for your outdoor fireplace project, be ready to brace yourself for an unmatched customization experience. From start to finish, our team will work with you to build a stunning fireplace that perfectly complements your landscaping designs. We boast of our professional workmanship and will build your Kingwood outdoor fireplace using high-quality materials such as stucco, brick, flagstone, ledgestone, tile or granite. No matter what feeling you want to evoke, we will apply our superior design skills to help your home stand out and increase its resale value. Order a fireplace for your outdoor space today by calling us. We will get your fire burning and your party going in no time! Kingwood Outdoor Fireplaces – A Great Addition To Your Backyard! fireplace lends you the perfect opportunity to take your outdoor entertainment to the next level. Everyone loves to cook marshmallows on an open flame! The warm Kingwood weather makes an outdoor grill, barbeque, or social gathering even more attractive. Not only do Kingwood outdoor fireplaces give your party a generous extension by providing inviting lighting and warmth, an outdoor fireplace also makes snacking a great convenience. Whether it is toasting marshmallows or roasting hot dogs, you and your guest can enjoy some delicious bites while sharing stories and fond memories around the dancing flames. Even if you are not a party person or a brilliant cook, you can still own a Kingwood outdoor fireplace for its sheer beauty. 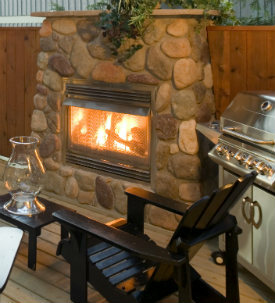 You will be surprised how a simple fireplace can transform your lifeless outdoor space into one that bursts with vigor! Just sit back and intoxicate yourself with the crackling fires and the music of the night.